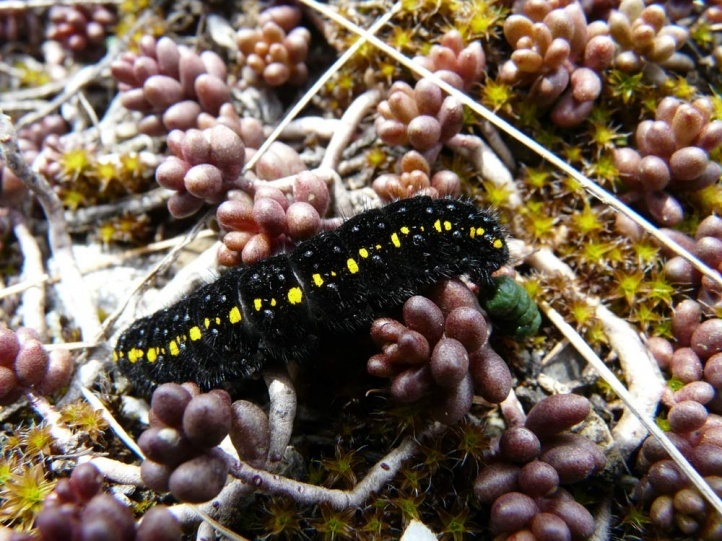 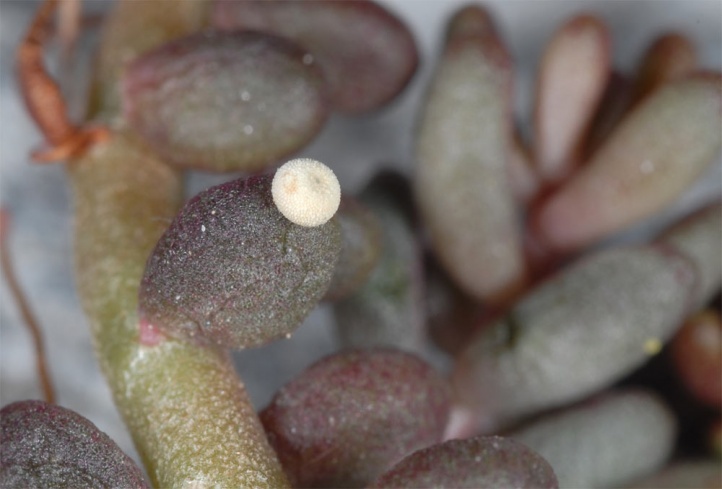 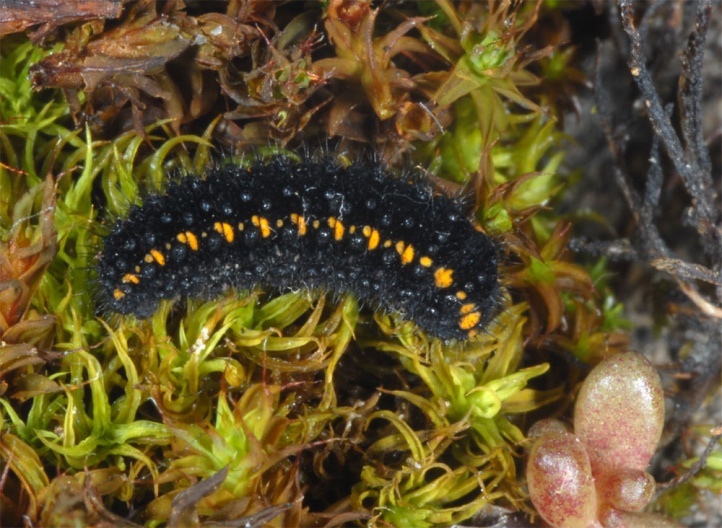 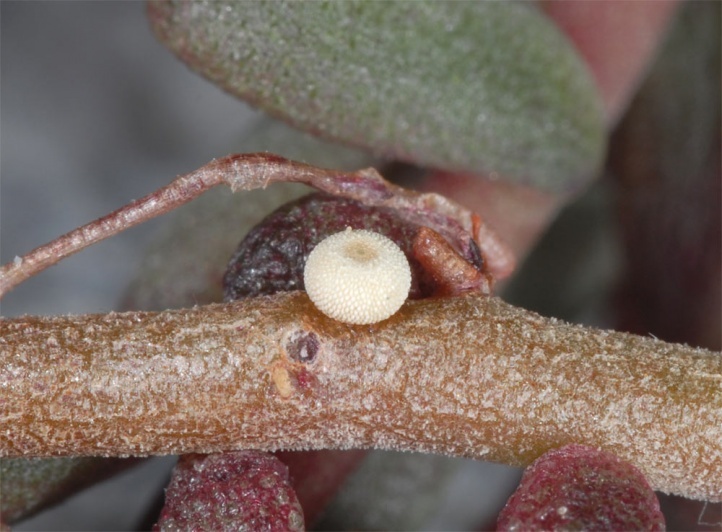 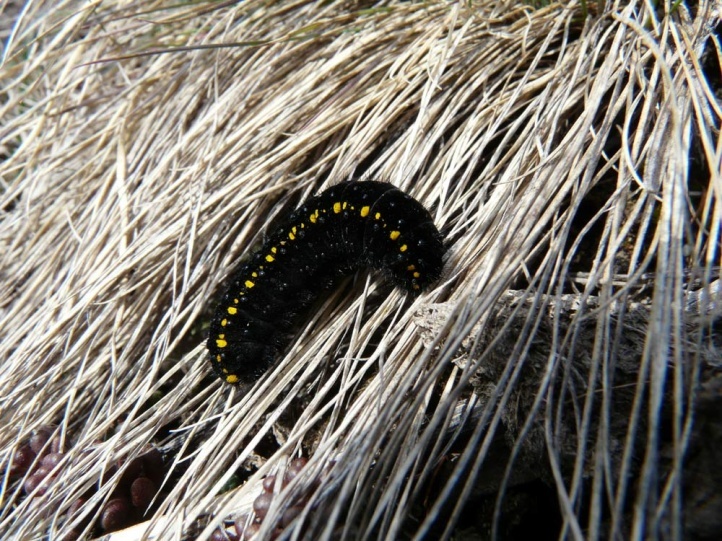 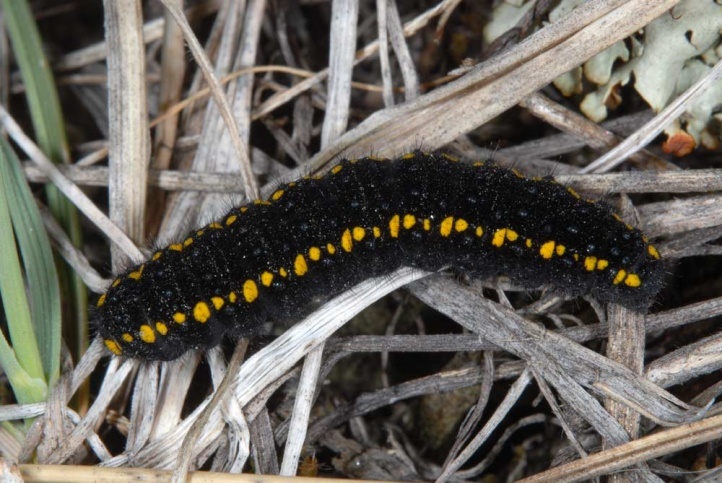 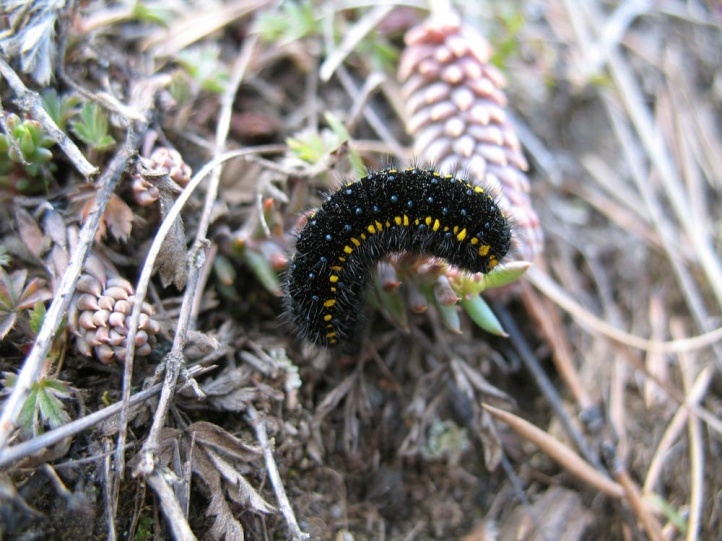 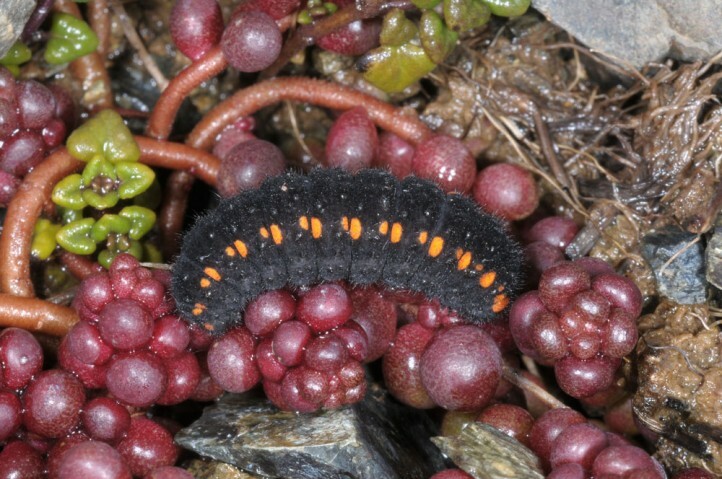 The caterpillar feeds on Crassulaceae like Sedum species (Sedum album in particular) and sometimes Sempervivum and related genera (Jovibarba). 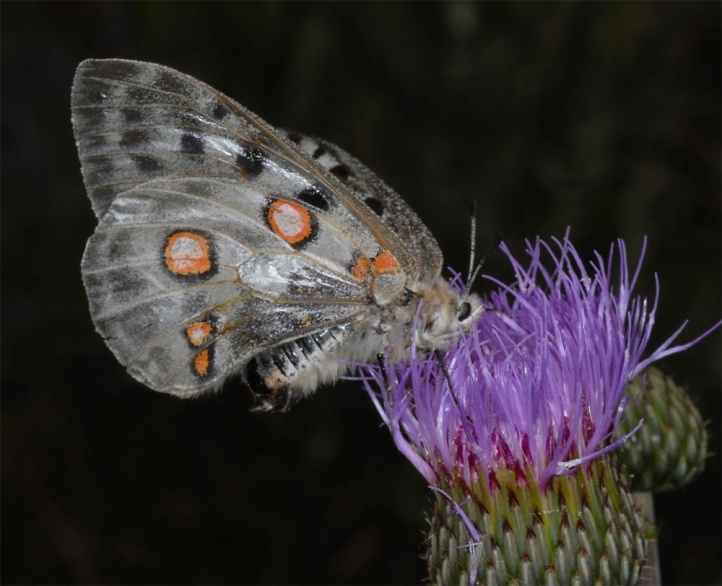 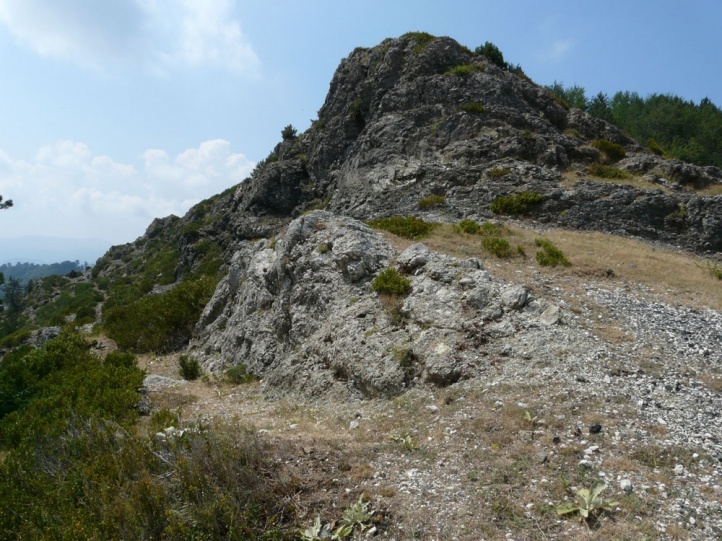 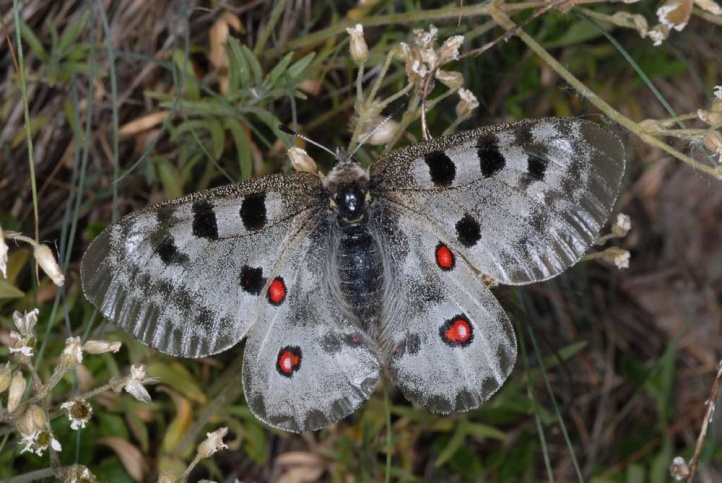 Parnassius apollo inhabits rocky and stony places, natural stone walls in the neighborhood of actual habitats and formerly (now little more) also vineyards. 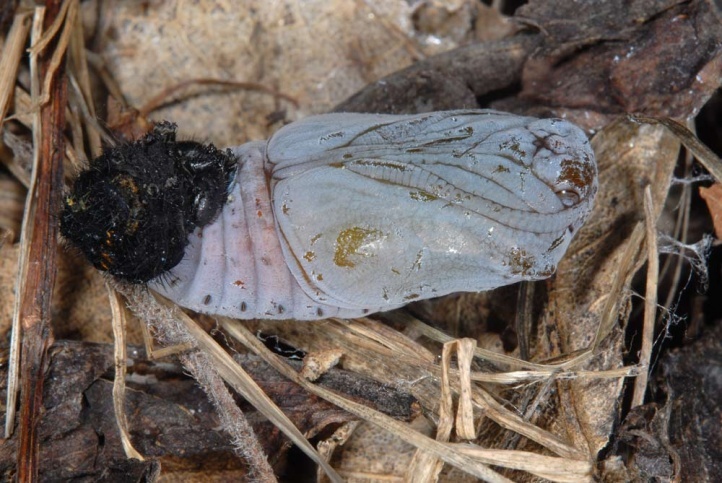 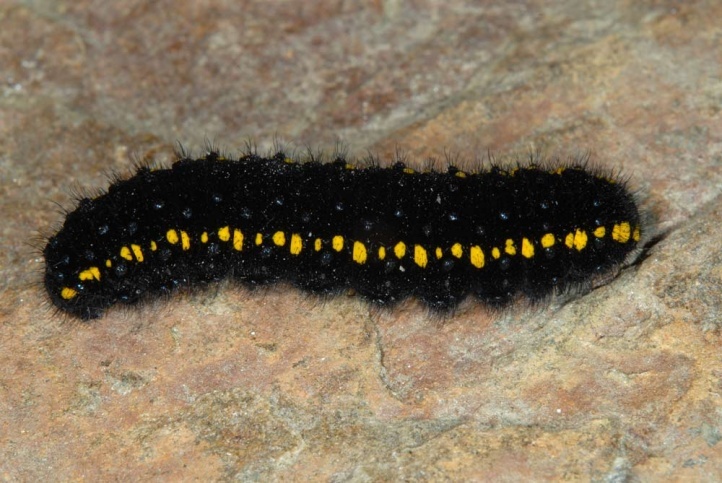 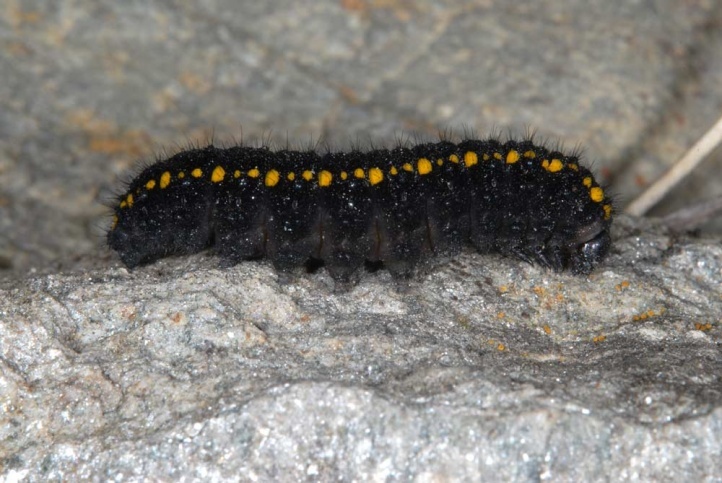 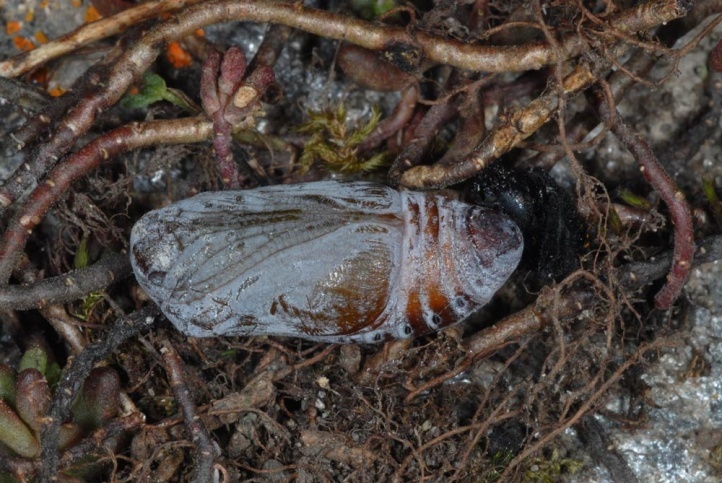 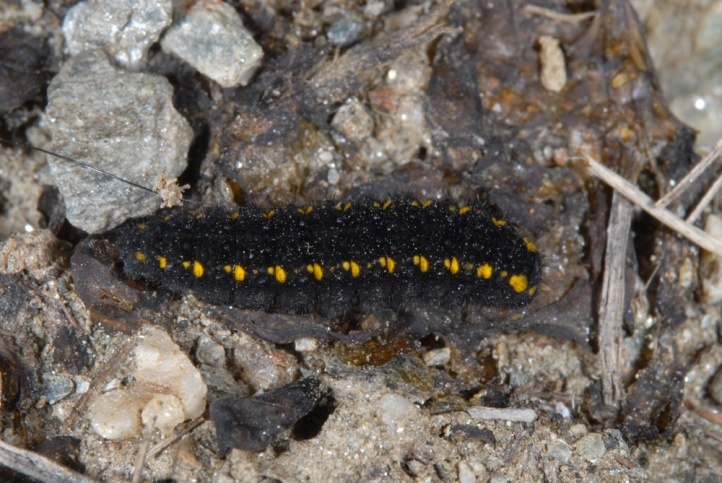 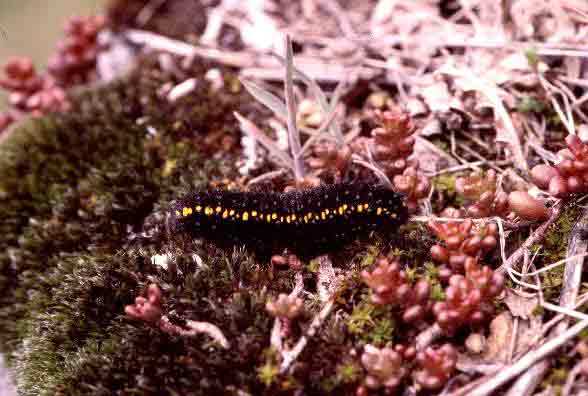 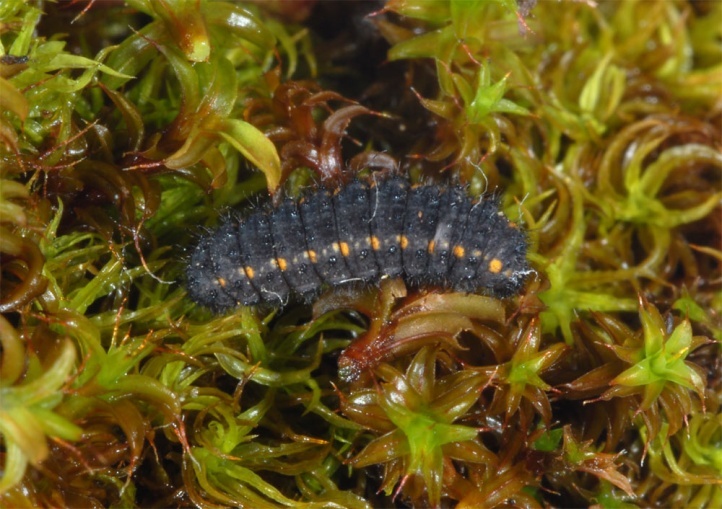 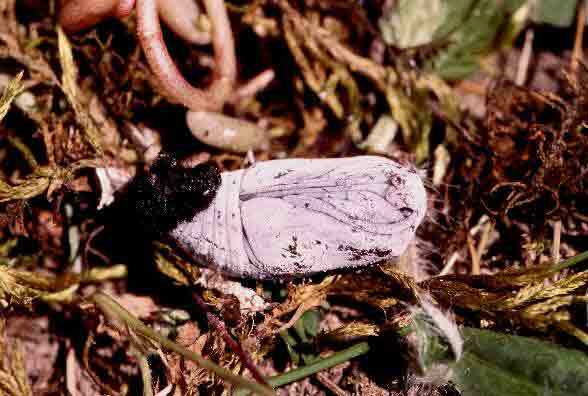 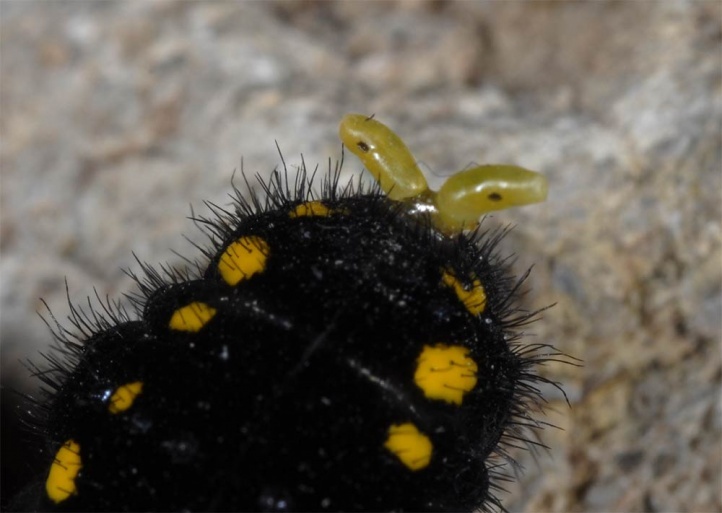 The caterpillar is found in rocky, shallow places with little soil. 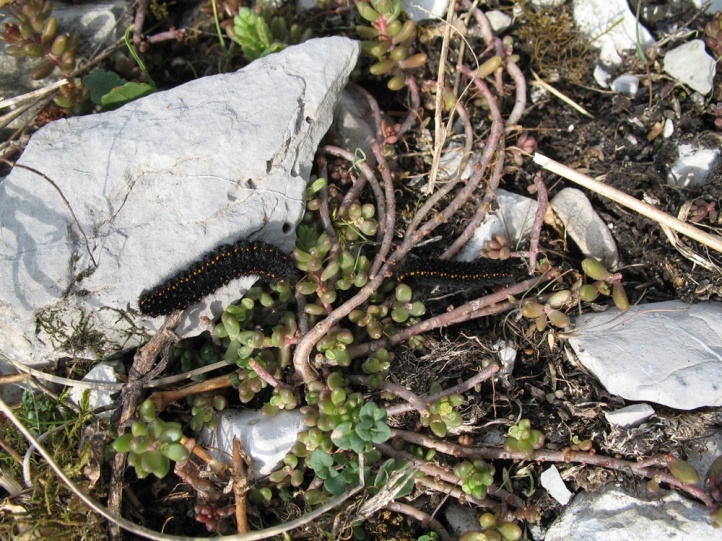 I found them very often eg. 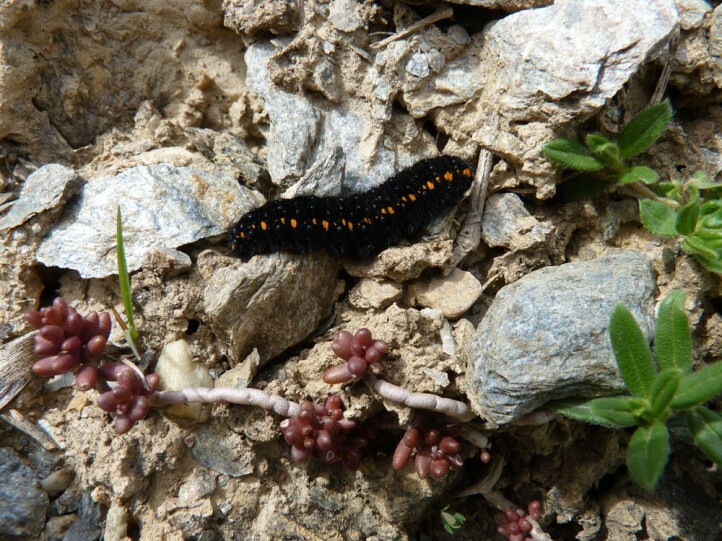 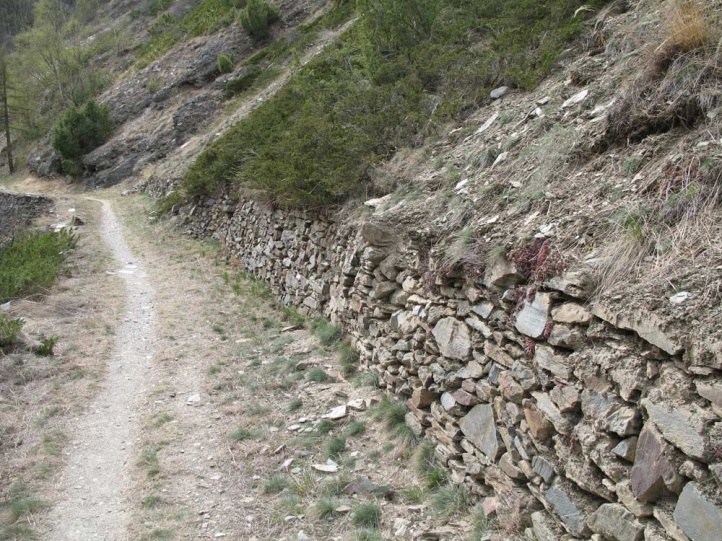 in May at 1000m above sea level in the Susa Valley (Piedmont) on dry stone walls in nutrient-poor grasslands or from mid-April to July at many places in the Valais. 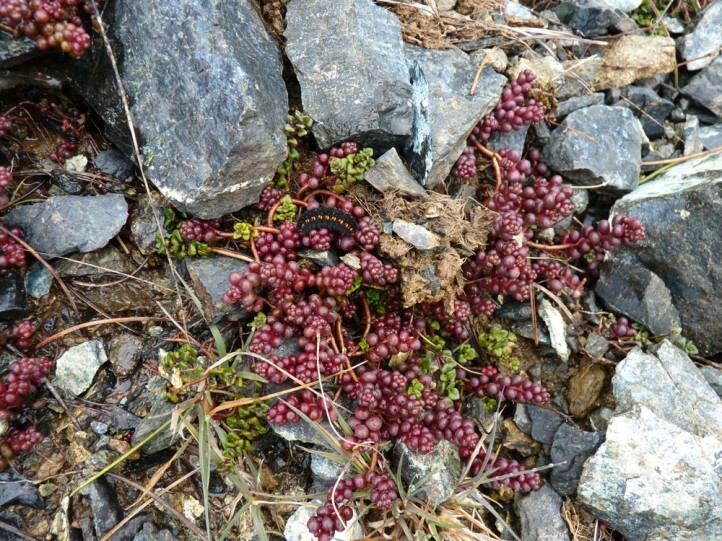 They also occur in alpine meadows without rocks, but with plenty of open floor, mosses, Sempervivum and Sedum (so in Valais in 1500-2300m above sea level on Sedum reflexum and Sempervivum). 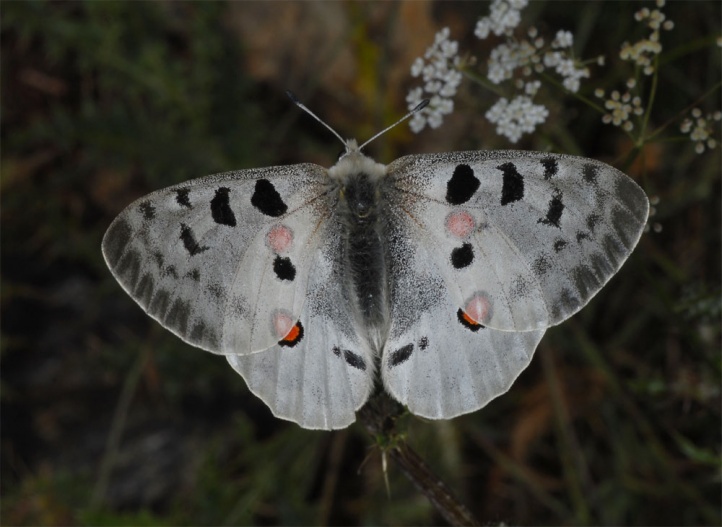 Parnassius apollo hibernates as a developed caterpillar in the egg. 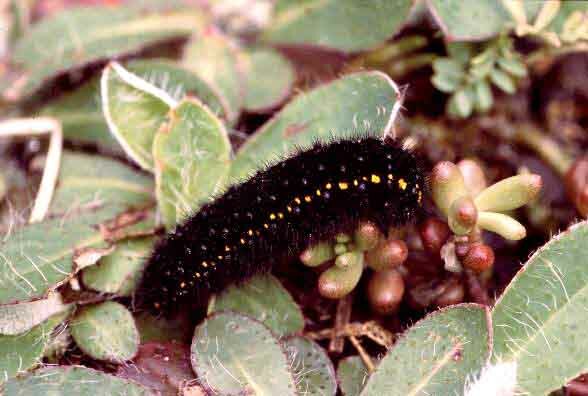 The caterpillar lives from March/April to May or June. 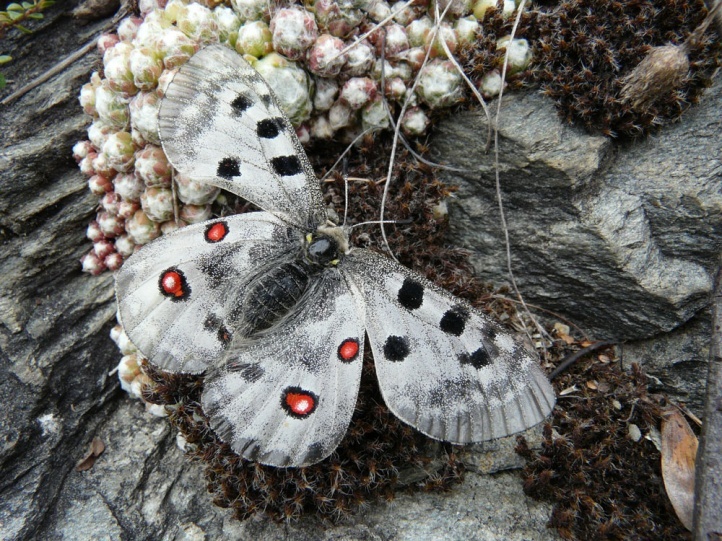 Some can be still found in July, together with fresh and worn adults (Valais, July 2012), which explains the long flight time. 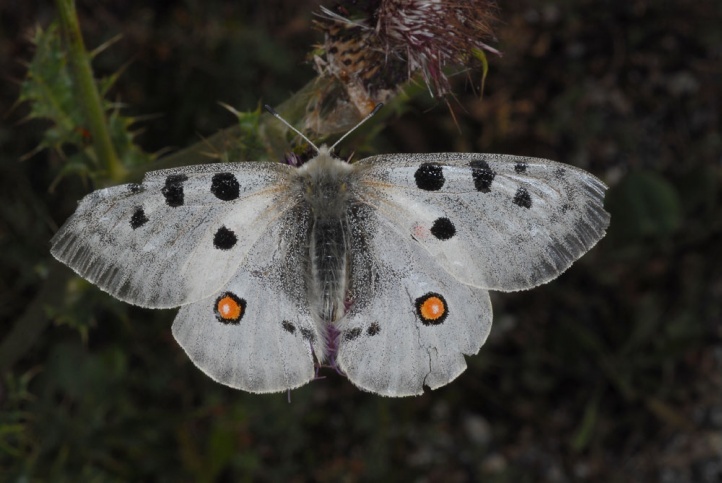 The butterflies are on the wing in Central Europe in the lowlands generally from the end of May to July/early August, and in high altitudes from June to early September. 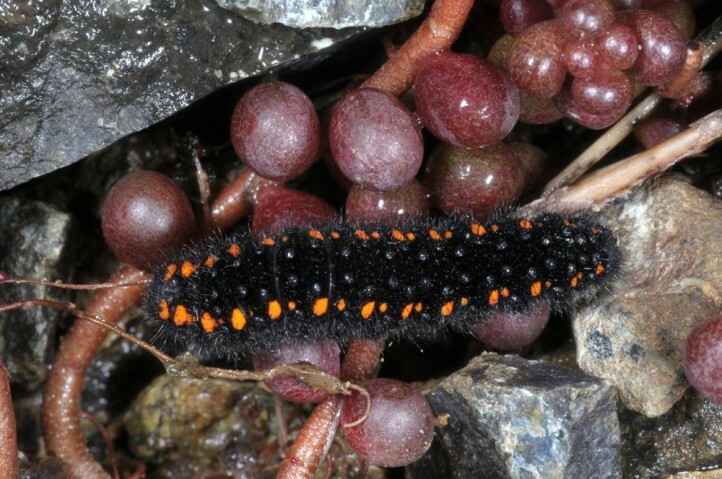 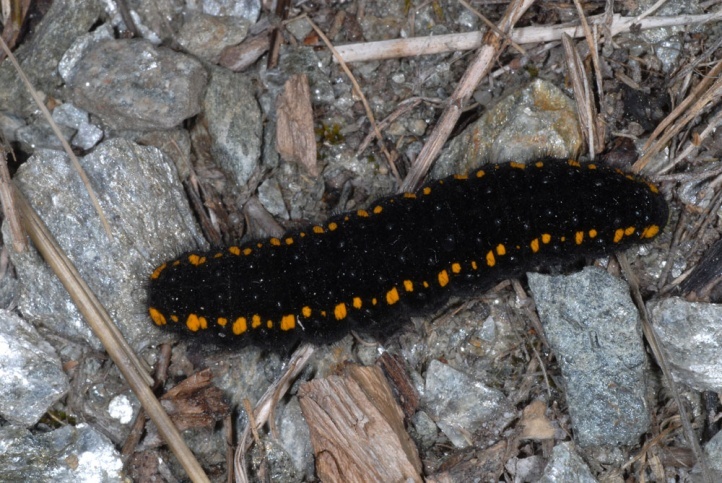 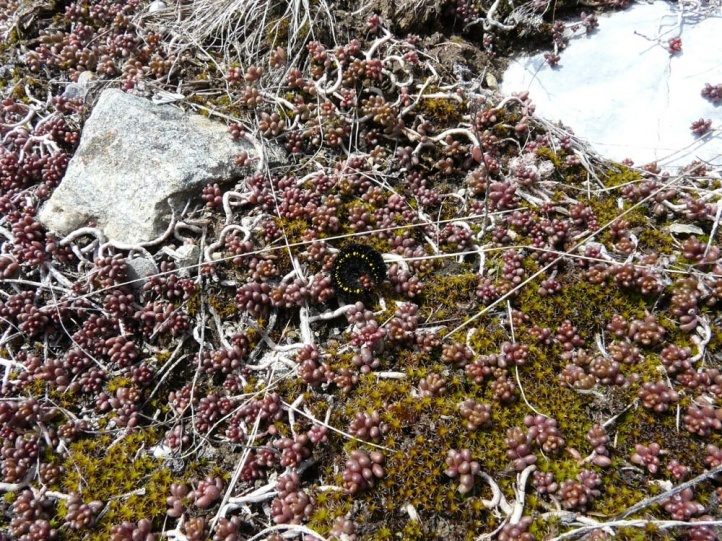 In the Southern Alps the first adults appear already in early May. 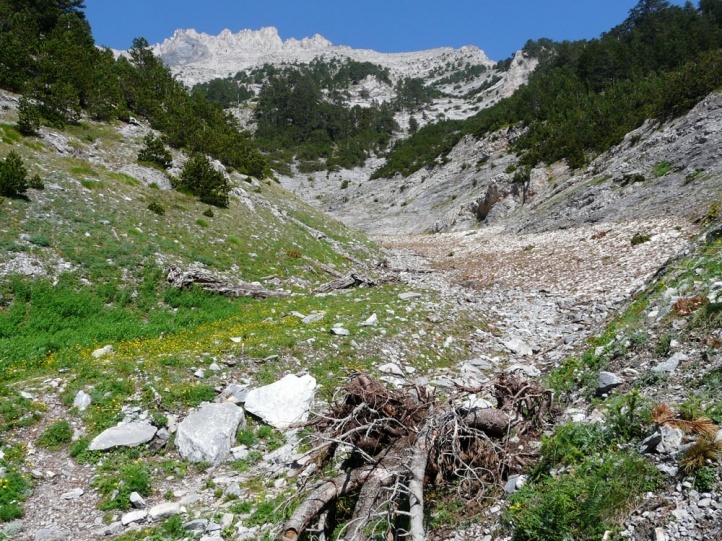 In the Greek mountains the main flight time is from early July to early August (Mount Olympus or northern Pindos in about 1500 to 2000m above sea level). 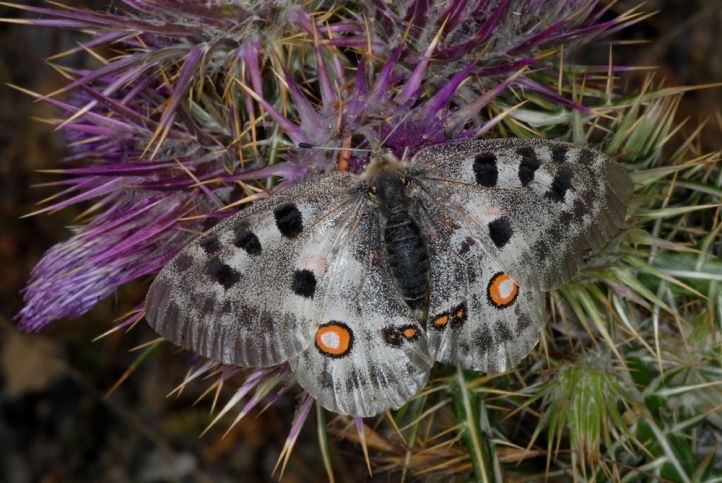 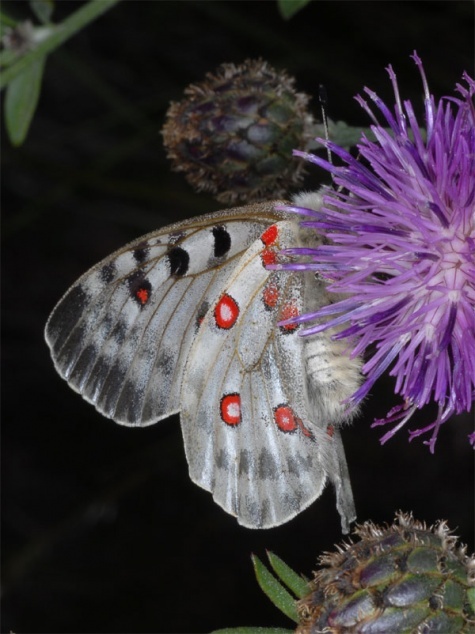 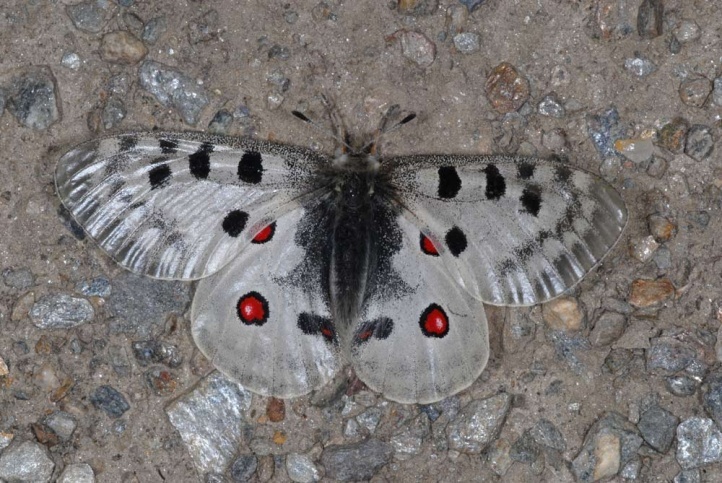 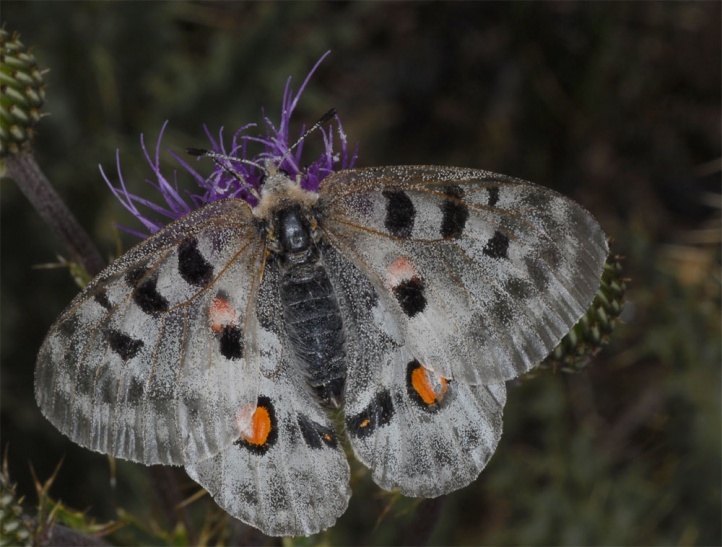 In Central Europe outside the Alps Parnassius apollo is threatened with extinction due to habitat loss (afforestation, abandonment, bush encroachment, housing and road construction, partly rock excavation, vineyards). 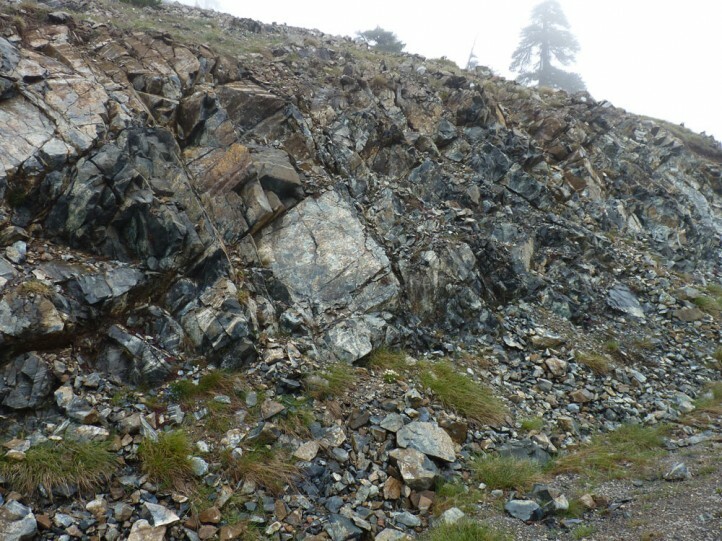 But in certain cases new habitats can originate from the construction of new quarries, but only near population patches and hardly by current large-scale mining methods. 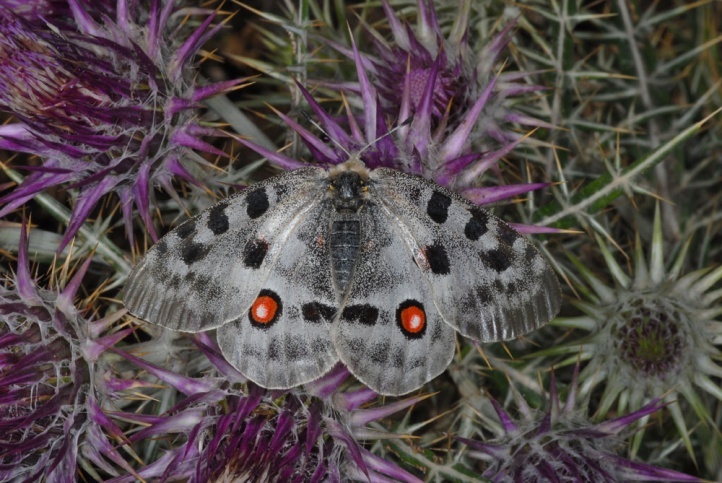 In Germany few populations still exist in the Moselle Valley, in Baden-Württemberg (Swabian Alb) and a few in the Franconian Alb in Bavaria. 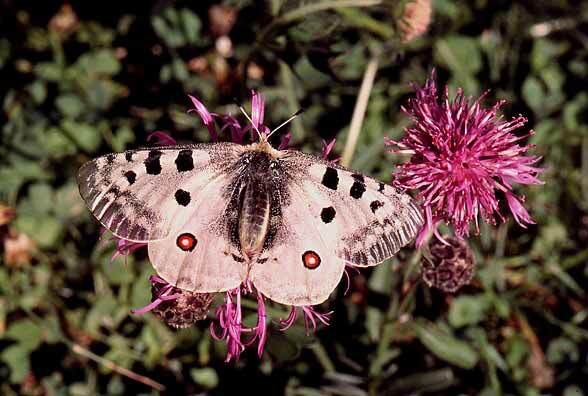 In the Bavarian Alps the Apollo butterfly flies very scattered and local for example on Nagelfluh with Sedum album near Immenstadt. 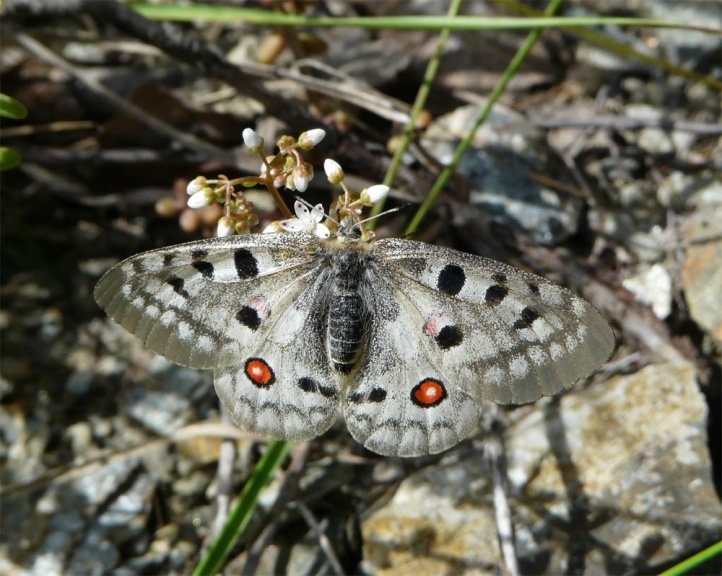 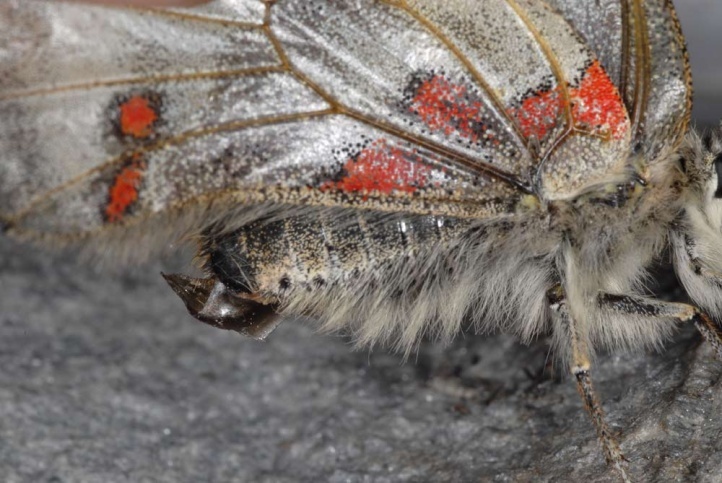 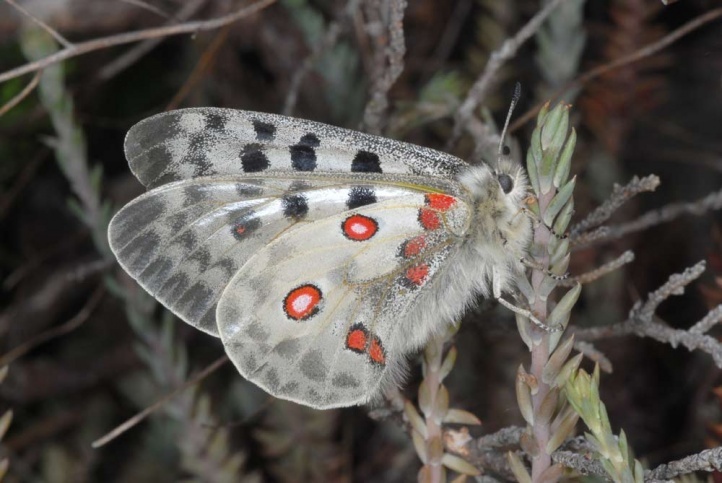 In the Central and Southern Alps, however, Parnassius apollo is often very common (e.g. 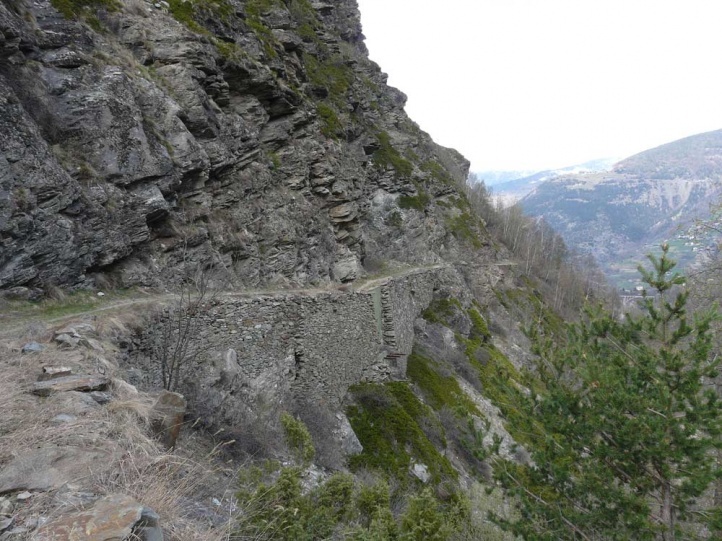 in Valais or French Alps) and in decline only at low altitudes due to the influence of man. 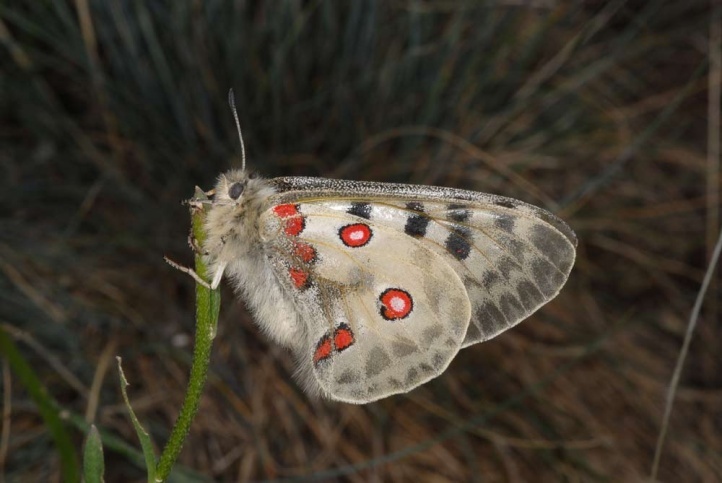 From the ecological behaviour Parnassius is a primitive group of species. 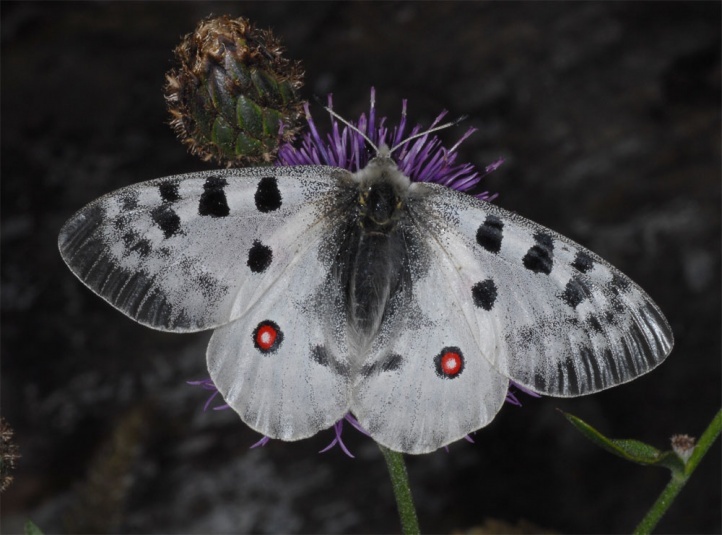 An interesting feature of the Parnassius species is also the so-called Sphragis, an construction at the female lower tip of the abdomen that is built up by male secretions during mating and that prevents the female from further copulations. 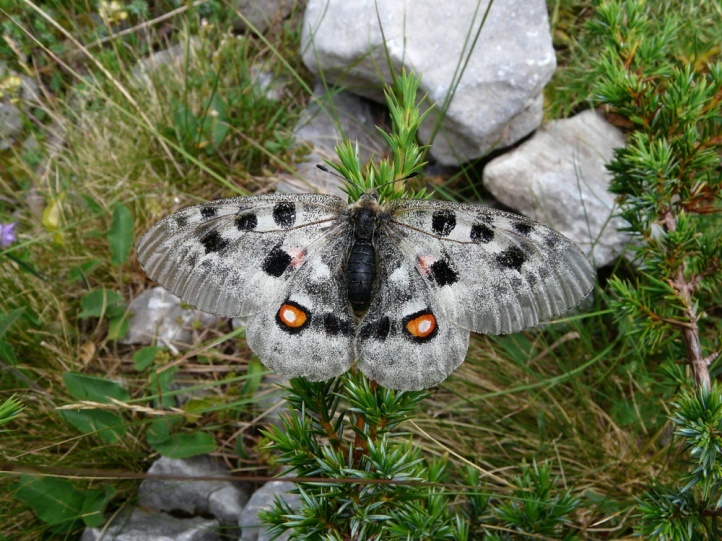 The distribution of Parnassius apollo extends locally across the mountains of Europe and parts of Asia. 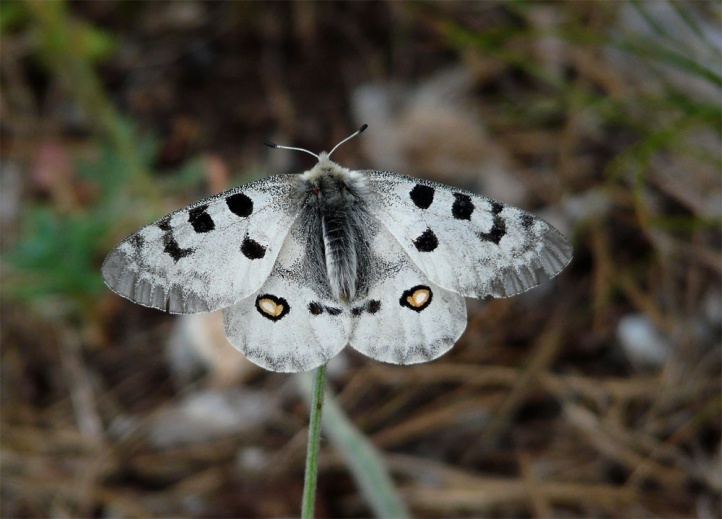 In most of the lower mountains of the northern Central Europe Parnassius apollo is already extinct due to habitat destruction. 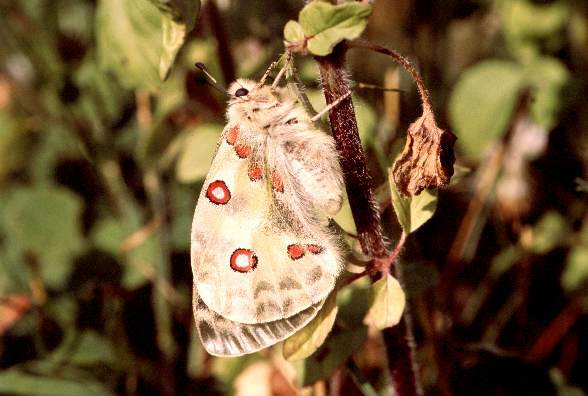 In Scandinavia Parnassius apollo also occurs at sea level on rocky shores.